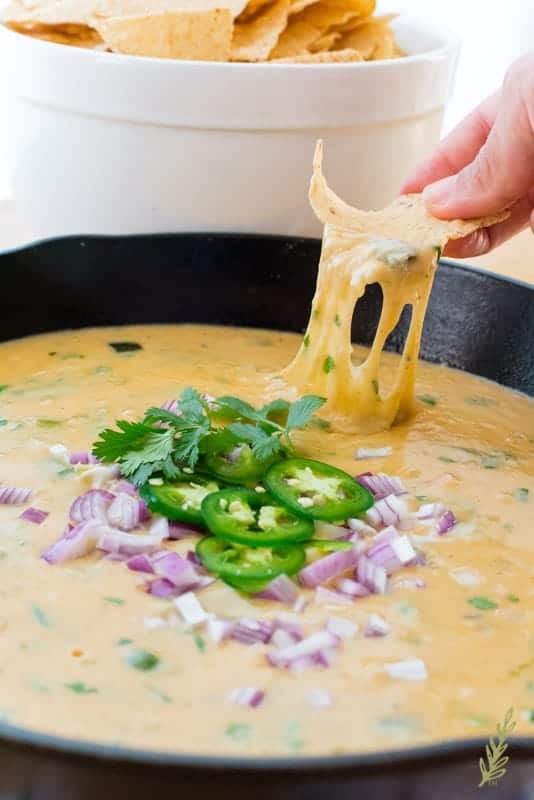 Roasted Poblano Queso Dip- Big Game Friendly! So, I just finished doing my taxes. I’m really struggling with being fiscally responsible, Friend. That damned refund is so small!! I know, I know, “Dave Ramsey says no refunds means you didn’t give the government an interest-free loan- that’s good!” BUT I WANTED TO BLOW IT ALL ON SHOES, FRIEND!!! I’ll get over it. In the meantime, the Big Game is coming up and we’re going to need lots of food to feed hungry football fans. Even though the Giants have been at home for a hot minute, we’ll still watch and pray the Rams destroy the Pats. How do warm tortilla chips and a Roasted Poblano Queso Dip sound? Sounds a lot better than a paltry INCOME TAX REFUND IF YOU ASK ME!!! I’m okay. I’m good. Not really, but I’ll be a’ight. Poblano peppers, because we need roasted poblanos, of course. There’s also three types of cheese up in here: gouda (super-meltedy <–totes a word), monterey jack, and white cheddar. I use extra-sharp cheddar because I’m so “extra” myself. If you’d like, replace the monterey jack cheese with pepper jack to add more spice to the dip. We’re going to use fresh onion, garlic, lime juice, ground cumin, chili powder, salt and pepper, and some fresh cilantro to flavor the dip. Oh! I almost forgot the BEER!!! 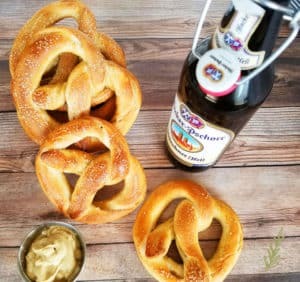 Yes, beer is included in this recipe because it helps the dip stay smooth. If you don’t drink alcohol (even burned off alcohol), just replace it with more milk. I use a lager or an ale beer. *Avoid heavy, malty beers like porters or stouts. Don’t freak out about the fact that this recipe uses two roasted poblanos. In spite of the fact that they look like gigantic jalapeño peppers, they’re not spicy. I don’t find them spicy, at least, but you may get one that has a bit of stank on it. However, with everything else that’s in the dip, they won’t be too potent. Roasting peppers is a breeze. Because I’m deprived (HÉCTOR!!! ), I don’t have a gas range (first world problems, and all). So, instead of roasting them over an open flame like I’d love to do, I use a crazy hot cast iron skillet! The great thing about the skillet method is that it makes this dip a one-pot wonder. 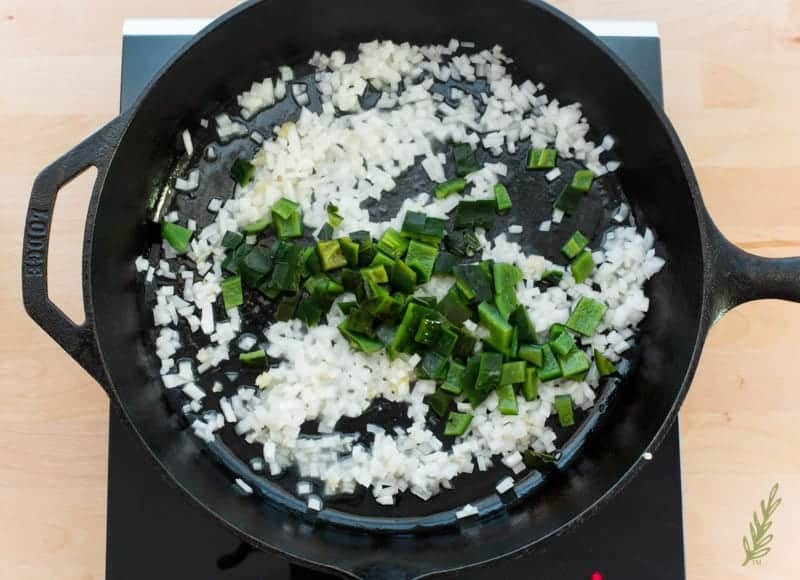 A well-seasoned skillet should require no oil to prevent the pepper from sticking, so just begin by heating the pan over high heat. 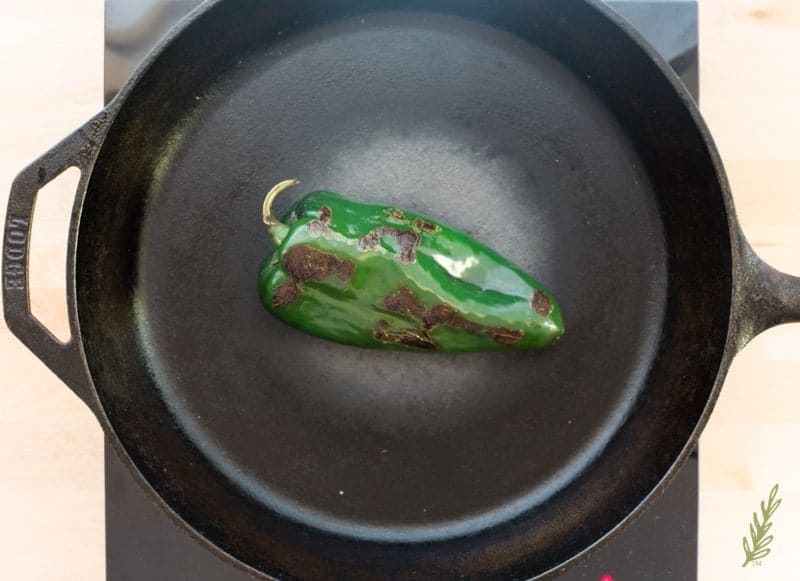 Once your skillet is searingly hot, press your poblanos onto the surface. Like, press press. You want as much of the skin to touch the skillet as possible. The pepper will begin shimmying and it’ll sound like it’s popping, because…well, it is. You can use tongs to press the pepper down onto the skillet if your hand is getting too hot. Flip the poblanos over to roast the other sides. Most poblanos are shaped triangularly, so rotate it thrice (you like that Shakespearean lingo, there?!? )- searing each side like you did the first time. 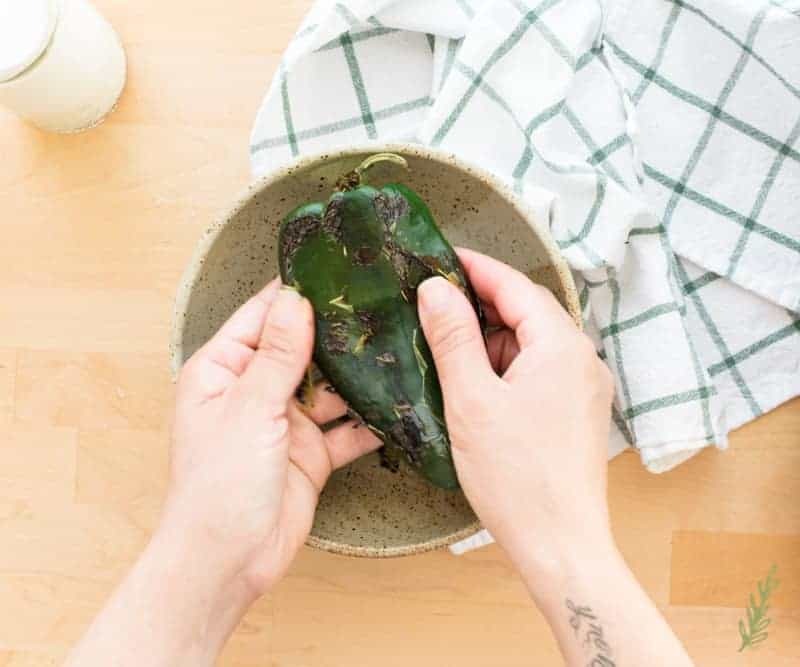 What Does Roasting the Poblano Do? This “roasting” we’re doing is not really roasting. Typically, roasting involves enveloping a food in heat, or hot air. We’re doing a combo of searing and roasting, but “Roasted Poblano” sounds a lot better than “Seared and Roasted Poblano”- at least to me it does. At any rate, the reason we roast the poblanos is to caramelize the skin, which will, later, add flavor to our dip. 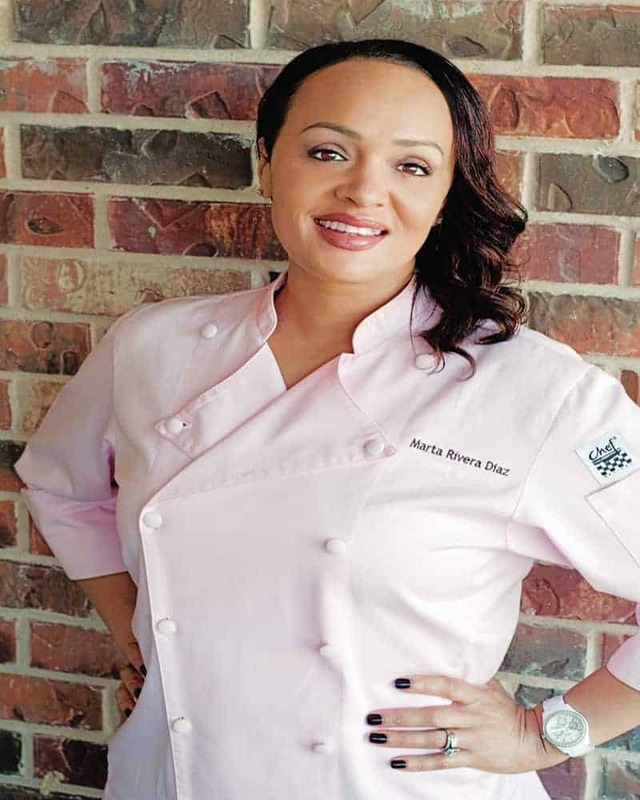 If you’ve forgotten, caramelization is the culinary term used to describe the browning of sugar in a given item. Anytime you see brown or black in a food, you’re looking at caramelization. Once you’ve seared and deeply browned the peppers’ skins, remove the them from the pan (right now there’s too much residual heat in that pan to do this next step). 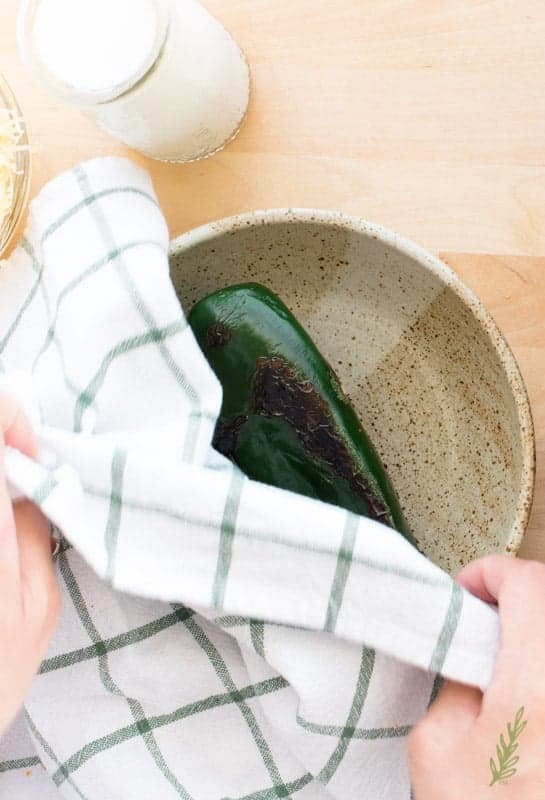 Put the peppers into a bowl or dish and cover them with a clean tea towel. Allow them to steam under that towel while you prep the rest of the ingredients. This steam time will loosen that skin, which will make peeling them easier. Why Bother Peeling the Peppers? I’m so glad you asked! The reason I prefer to peel peppers is because, surprisingly enough, pepper’s have a pretty tough skin. Not only does it make the sauce a bit tougher to chew, the skins (after being roasted) like to peel away from the pepper once we stir it into the dip. The result is a dip that’s unappealing. Once the pepper has steamed for ten minutes (or after you’ve finished your prep), use your finger to peel or rub off the charred bits of pepper skin. I was able to rub my thumbs over the skin and it just flaked away. It can be tedious if you haven’t charred the pepper well, or if you haven’t allowed it to steam fully. Once you have peeled away the skin, give it a quick rinse under cold water. Pat them as dry as you can. Now that we have roasted poblanos, we need to cut them to add to our queso dip later. 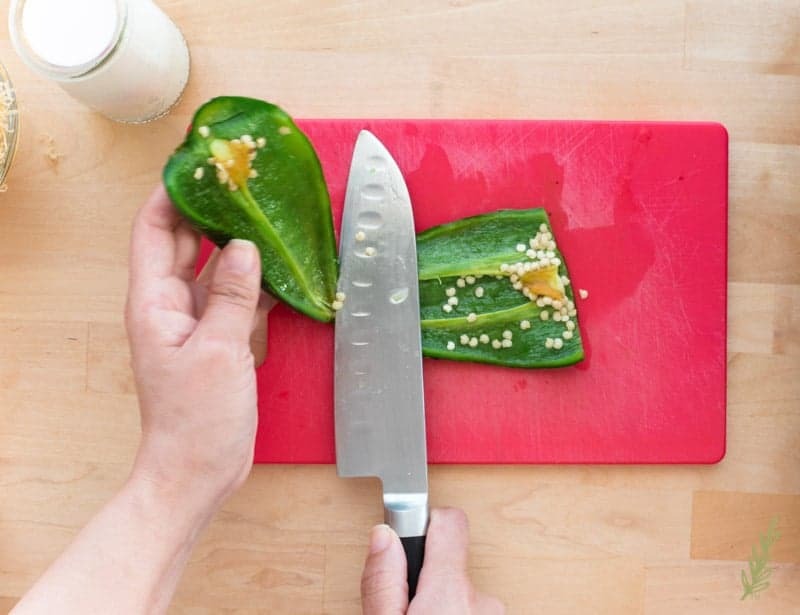 Place your peppers onto a cutting board and, with your chef’s knife, cut off the stem-end of the pepper. 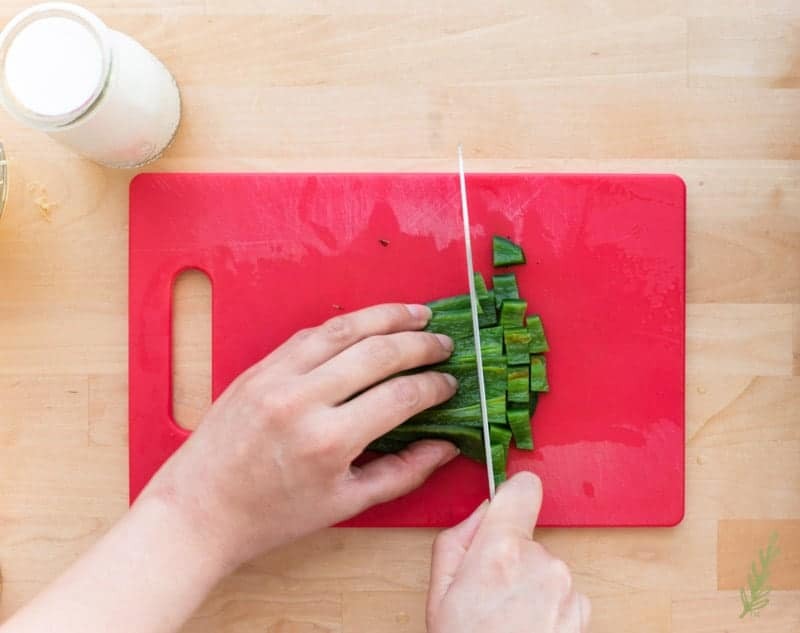 Lay your knife parallel to the cutting board and cut the pepper in half, lengthwise. 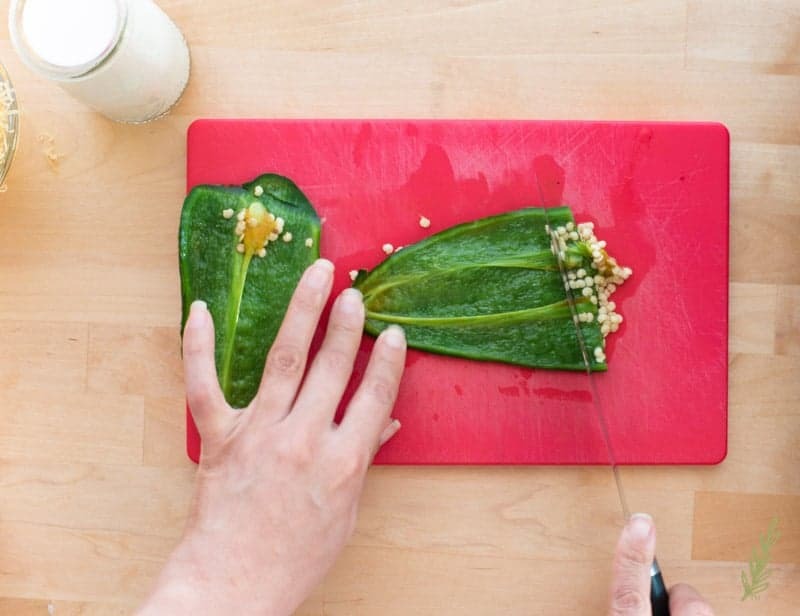 Use the back of your knife to scrape away the white membrane and the seeds. I emphasize the word “back” because I don’t want you to dull your knife blade unnecessarily. Discard the seeds, membrane, and tops. 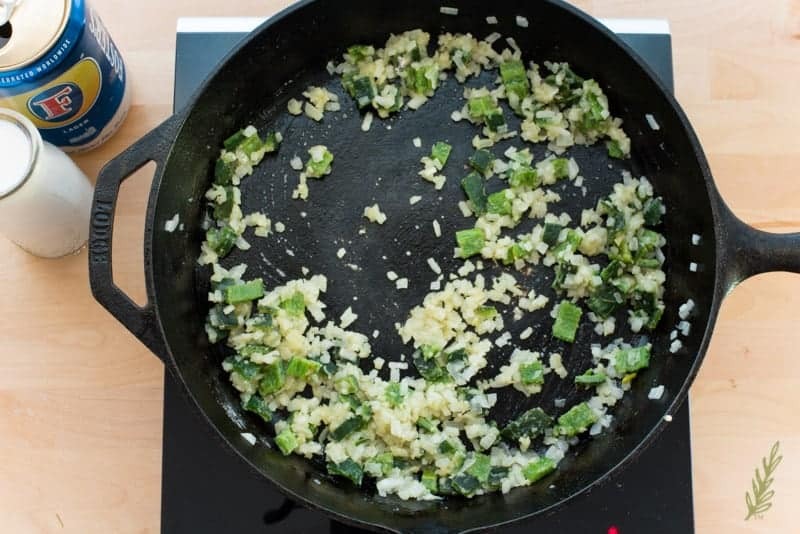 Get that skillet back onto the burner and crank the stove up to medium-high. 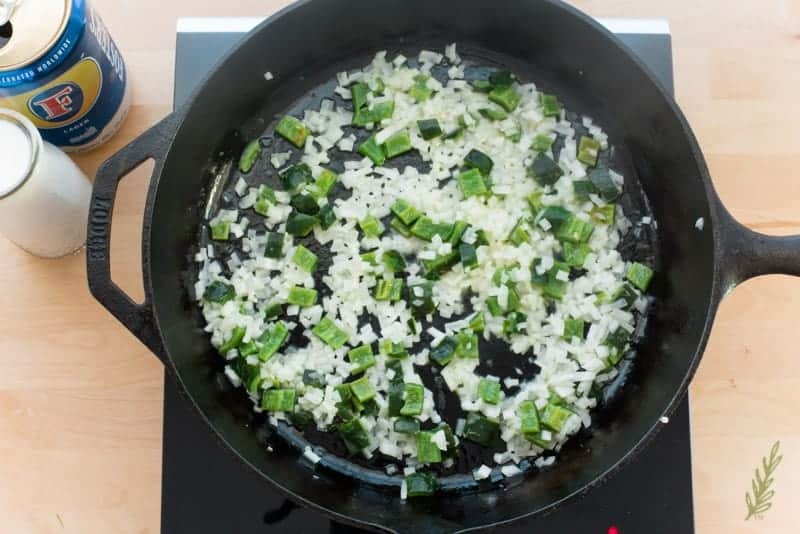 Toss in pats of butter (six tablespoons to be exact) and allow the butter to melt; stir in the onions, garlic, and poblanos using a wooden spoon. Let the veggies sauté until they’re glossy and opaque- about four minutes. Now you need to add the all-purpose flour. That, when combined with the butter, will create a blonde roux which will thicken our sauce. You need to stir the flour into the veggies, then allow it cook for at least a minute. Any less than a minute and your sauce will taste of raw flour, which is just no bueno. Don’t overcook it, though, because that will cause it to scorch. One minute is perfect. It’s a drunk milk sauce, but we’re not here to judge. The base of any cheese sauce the world ’round is a béchamel sauce, or, a milk sauce. 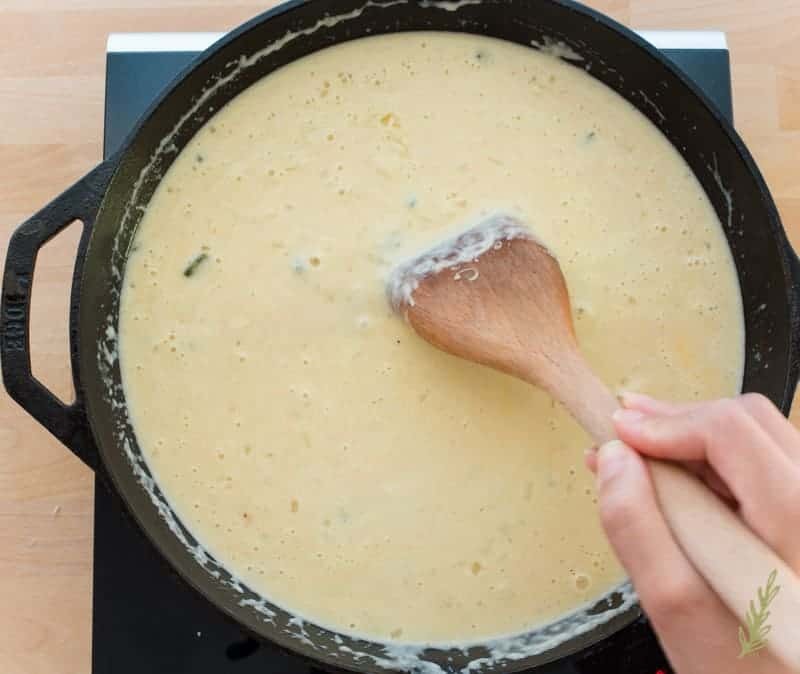 When we add cheese to this mother sauce, it becomes a mornay sauce. To get to that point, though, we need to add the whole milk to the roux that we created in the pan. Whenever you’re adding liquid to a hot pan, you need to watch out for the steam that’s going to rise, and could potentially burn you. Carefully, stir the milk as you pour it in because it will begin to cook- and thicken- immediately. Add the beer (or additional milk if you’re not using beer) to the pan- remember to stir! Now add the lime juice. This citric acid will help prevent the sauce from curdling and becoming grainy. Allow the mixture to heat until it begins to thicken, stirring frequently. To add flavor to the sauce, we’re going to add dijon mustard. 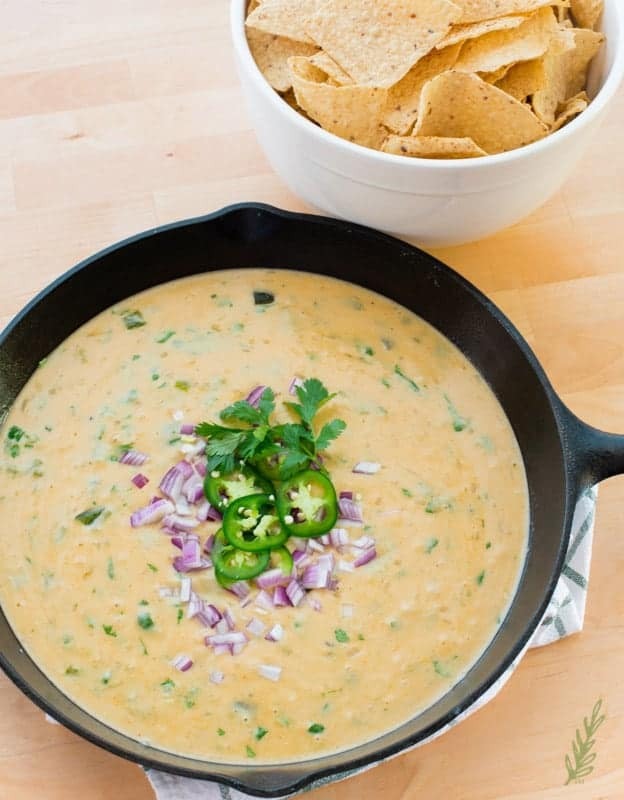 This unexpected ingredient gives the queso dip a tangy undertone of flavor. Stir the mustard into the sauce until it is combined. Now add the ground cumin, chili powder, one teaspoon of kosher salt, and a half-teaspoon of black pepper. SUPER Important Tip About the Cheese! 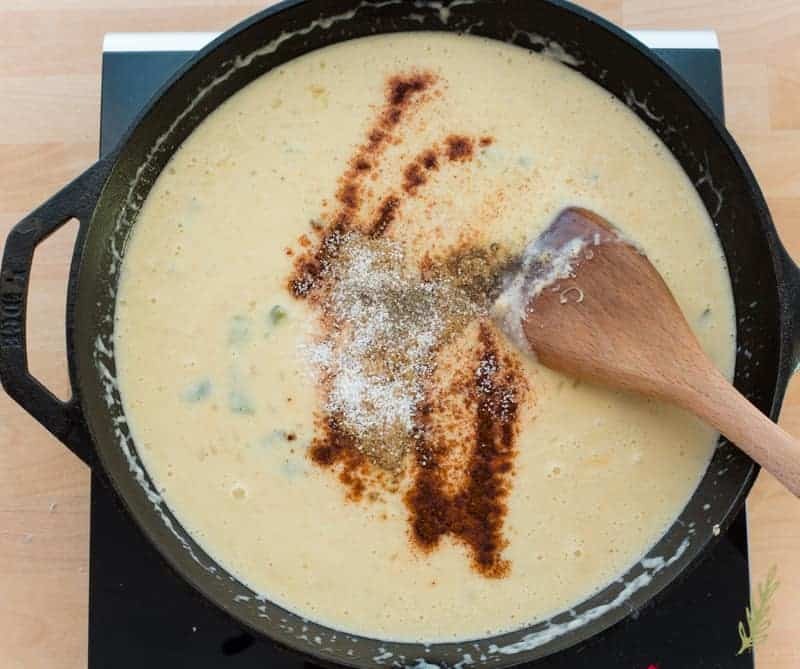 After you’ve seasoned the sauce- which is still a béchamel at this point- turn the heat off, or remove the pan from the stove altogether. You can’t simmer the sauce once you’ve added the cheese to it. 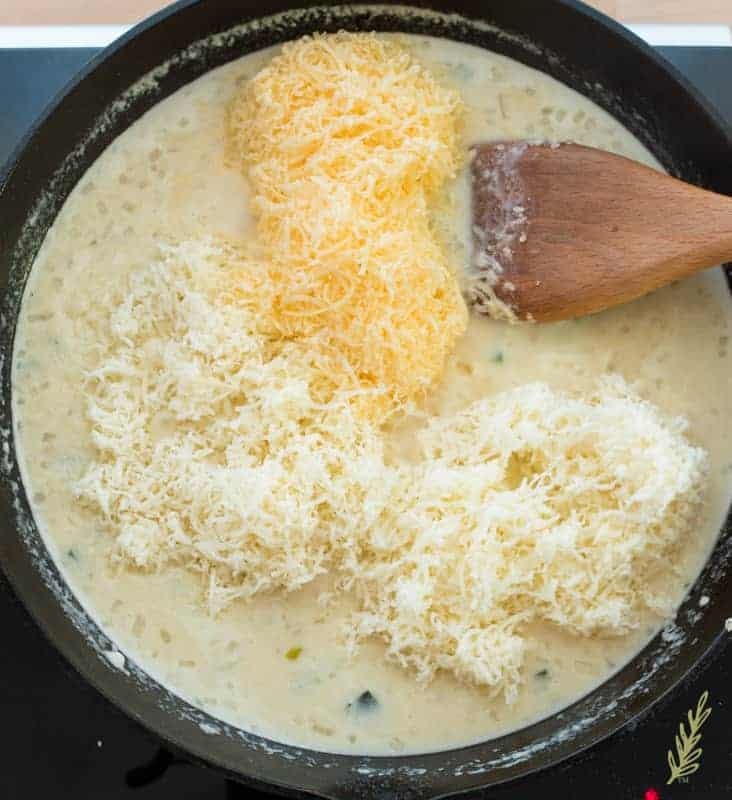 The residual heat from that molten lava of béchamel is more than enough heat to melt the cheese. Buy blocks of cheese and shred them at home. The bagged shredded cheese that you purchase from the store is tossed in a flour-like substance which prevents it from clumping. Not only does that make your sauce extremely thick, it prevents the cheese from completely melting. 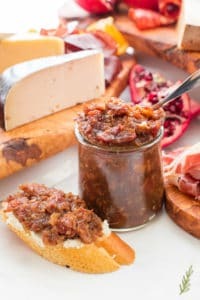 Have your cheese at room temperature prior to adding it to the sauce. If you have prepped your mise en place like I always tell you to do, then you should be good. Cold cheese will take longer to melt and will cool down the dip considerably. 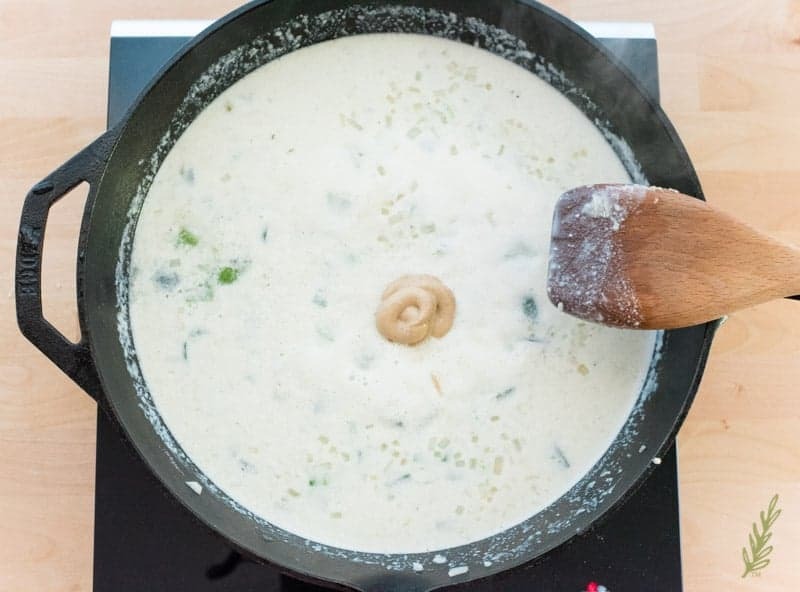 DON’T allow the dip to boil- or even simmer- after you’ve added the cheese. The cheese will curdle, which will make your sauce clumpy and gross. After you’ve added the cheese to the sauce, you’ll need to stir, stir, stir! If you can still see strands of cheese, you need to stir some more. It’ll look worse before it looks better. Once the cheese and the milk have blended, it will be creamy and smooth. After you’ve achieved that smooth, cheesy consistency, stir in the fresh cilantro. If it’s a little on the soupy side, that’s okay. Give it a minute, or two. ; as the sauce sits, it’ll thicken. Dip a chip into the queso real quick and taste it for salt and pepper. Add more as needed. I garnish my Queso Dip with chopped red onions, thin jalapeño slices, and some more cilantro. You can leave those off if you’re a purist, though. Set out a bowl of warmed tortilla chips, too. Pretzels are also great dipped in this Roasted Poblano Queso. I leave my dip in the pan I made it in. I have a warmer that will keep the cheese sauce warm without cooking it further. You could also transfer it to a slow cooker set on the lowest temp possible. Just remember not to cover it- condensation will leak into the queso and could cause it to curdle. Be sure to stir it occasionally. If you find that it’s getting too thick, add a few tablespoons of whole milk and stir to thin it out. 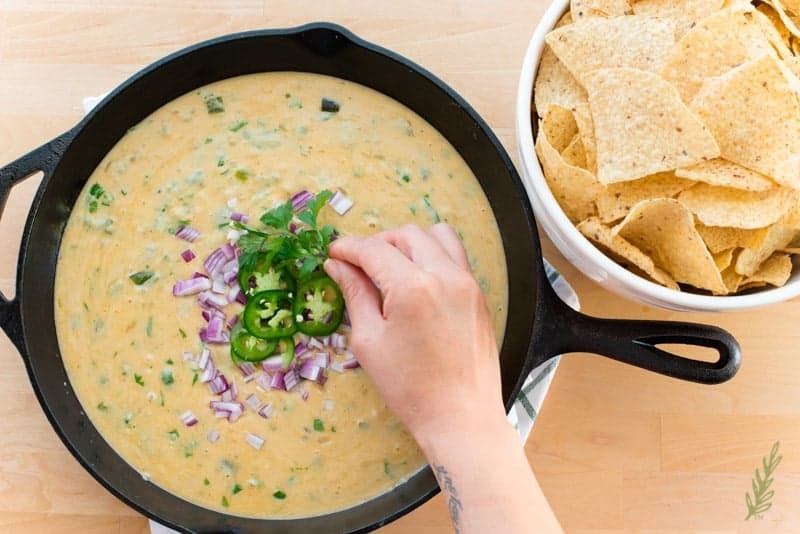 The longer this Roasted Poblano Queso Dip sits, the thicker (and gooier) it gets. My favorite thickness is just before it’s thick enough to break my chip, but not so thin it’s a sauce- you know? However you like it, it’s going to taste amazing. It’s done well sitting on the warmer for no more than four hours. Truth be told it never lasts that long (and this is a big batch). If you have leftovers, transfer them to a food storage container and put it into the fridge. Once you’re ready to reheat, add a splash of milk and nuke it in the microwave on one minute bursts until it’s reached your preferred consistency, stir after each minute. It may take more splashes of milk to achieve that smooth consistency. Go ahead and pin this so you can be prepared for game day! 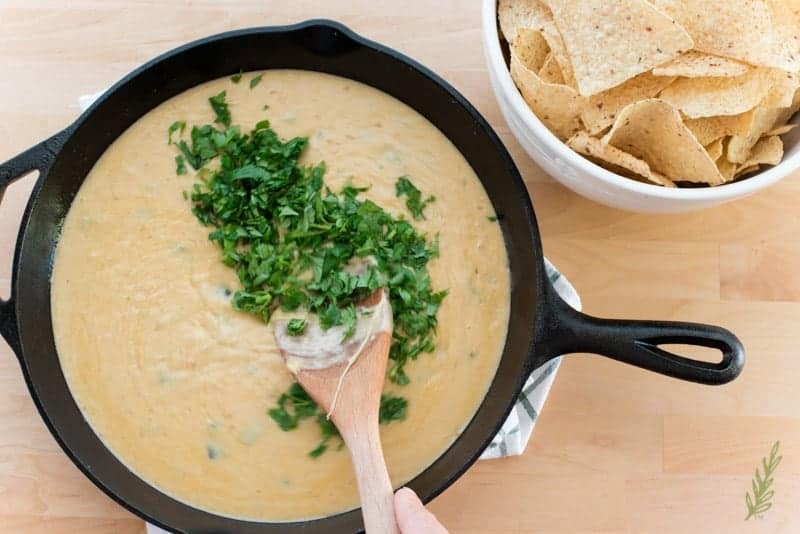 Serve this spiced, cheesy dip for your next Game Day celebration! Heat a 12" cast iron skillet over high heat. the pan over high heat. 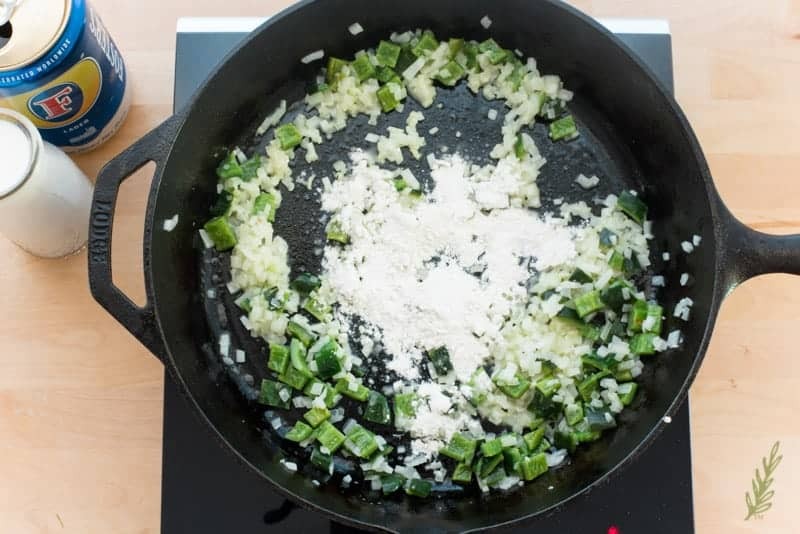 Once the skillet is hot, press your poblanos onto the surface, make sure as much of the skin is touching the skillet as possible. You can use tongs to press the pepper down onto the skillet if your hand is getting too hot. Flip the poblanos over to roast each side. Once you've seared the peppers remove the them from the pan, and put them into a bowl, then cover the bowl with a clean tea towel. Allow the peppers to steam while you prep the rest of the ingredients- or for 10 minutes. After the pepper has steamed for 10 minutes, use your finger to peel or rub off the charred bits of pepper skin. Discard any pepper peels. Once you have peeled away the skin, give the peppers a quick rinse under cold water, then pat them dry. Cut off the stem-end of the pepper, then lay your knife parallel to the cutting board and cut the pepper in half, lengthwise. Use the back of your knife to scrape away the white membrane and the seeds. Discard the seeds, membrane, and tops. Cut the pepper halves into strips a 1/2" wide, then turn the strips ninety degrees and cut them down to 1/2" pieces. Set aside. Return the skillet to the burner and heat to medium-high. Melt the butter in the pan, before adding the onions, garlic, and poblanos. Saute, stirring frequently with a wooden spoon. Saute the veggies until they're glossy and opaque- about 4 minutes. Add the all-purpose flour to the pan. Stir the flour into the veggies, then allow it cook for at least 1 minute. Carefully pour the whole milk to into the roux that we created in the pan. 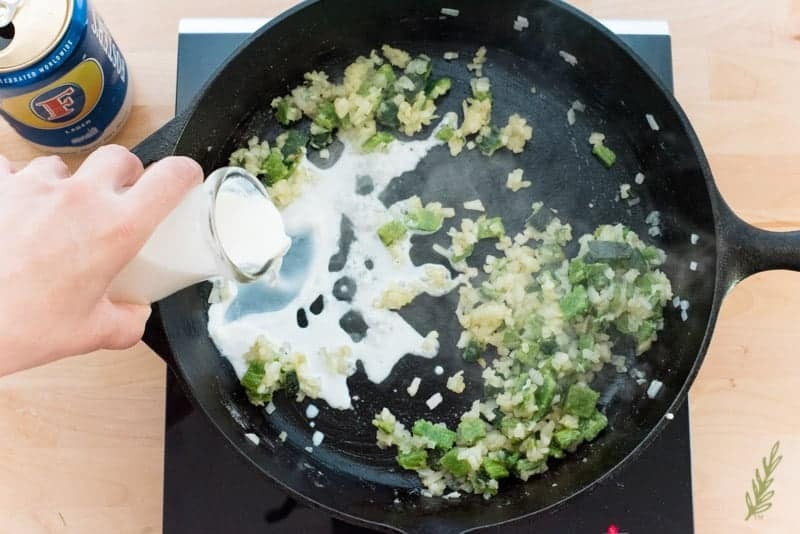 Stir the milk constantly as you pour it in because it will begin to cook- and thicken- immediately. 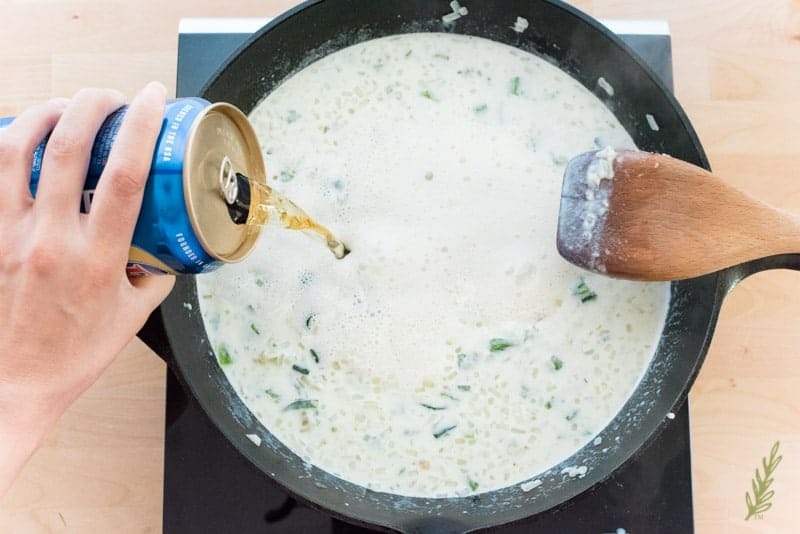 Add the beer (or additional milk if you're not using beer) to the pan- remember to stir! To flavor the sauce, stir in the dijon mustard, ground cumin, chili powder, 1 teaspoon of kosher salt, and a 1/2 teaspoon of black pepper. After you've seasoned the sauce, turn the heat off, or remove the pan from the stove altogether. Add all of the cheese to the sauce in the pan. DON'T allow the dip to boil- or even simmer- after you've added the cheese. The cheese will curdle, which will make your sauce clumpy and gross. 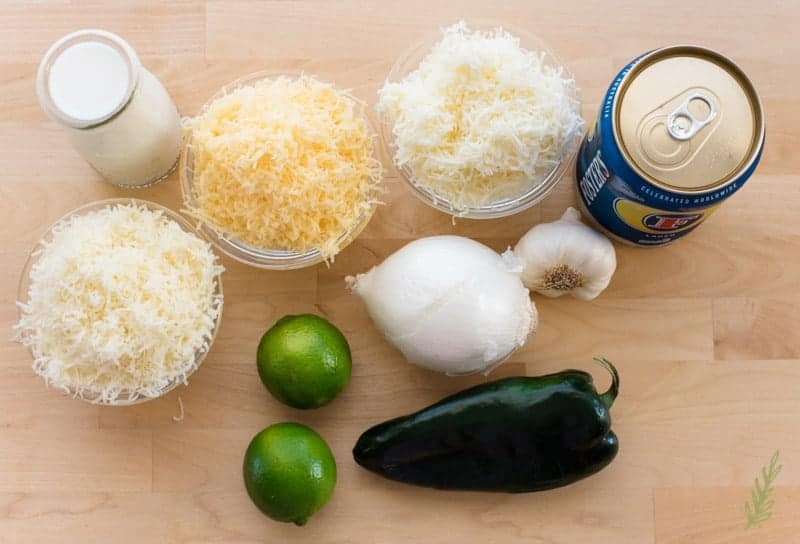 Once you've added the cheese to the sauce, stir until you no longer see individual strings of cheese, and the queso is smooth. After you've achieved a smooth consistency, stir in the fresh cilantro. Dip a chip into the queso and taste to see if it needs salt or pepper. Add more as needed. If the queso dip is a little on the runny side, that's okay. Give it a minute, or two; as the sauce sits, it'll thicken- just remember to stir it. Garnish the Roasted Poblano Queso Dip with chopped red onions, thin jalapeño slices, and some more cilantro. Keep uncovered. To keep the dip warm, I recommend transferring it to a slow cooker, or to a pot warmer. 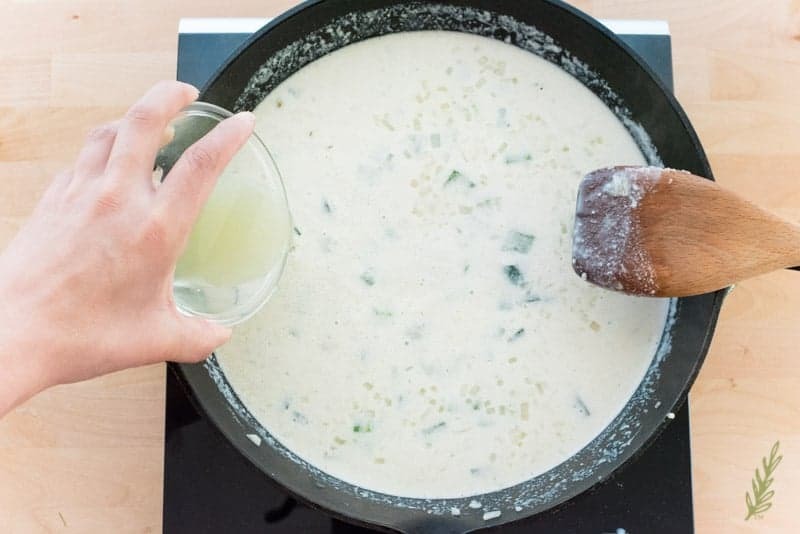 Add more milk if the queso seems to be thickening too much (adjust the seasonings as needed). The dip is good- held on warm- for up to four hours. Be sure to give the dip a stir every so often. 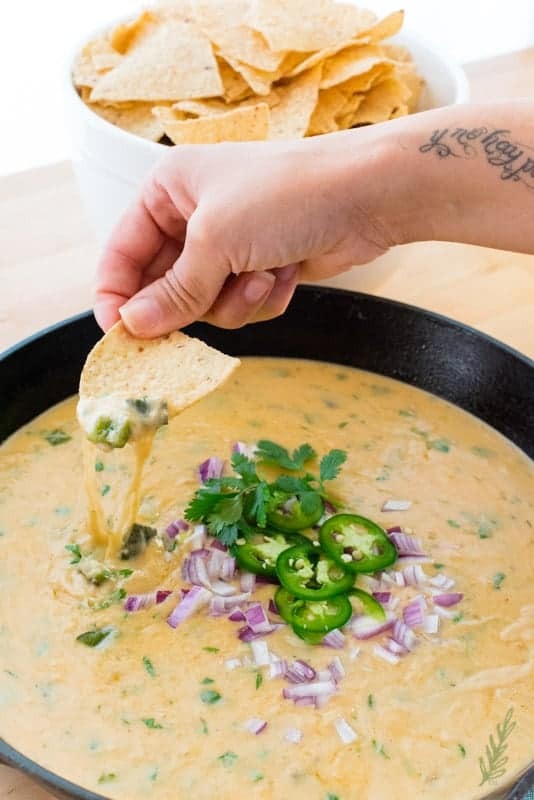 The longer this Roasted Poblano Queso Dip sits, the thicker (and gooier) it gets. Save any leftovers in a food container in the refrigerator for up to 48 hours. add a splash of milk to the dip, then nuke it in the microwave on 1 minute bursts until it's reached your preferred consistency. Stir after each minute. Add more milk (a tablespoon at a time) until you've achieved a smooth consistency. Adjust the seasonings as needed. It’s so good. The Super Bowl is a big thing here, so we always make sure to serve yummy food to watch it. You have to add the peppers if it’s called “Poblano Queso”, amiright? They really aren’t all that spicy, but just in case, you can mince them a bit more. oh this sounds so yummy…anything with cheese and I am good to go! 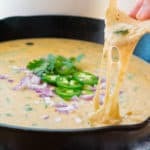 Though I cannot smell through pictures (or the computer), I most definitely smelled this queso as I read/looked through this post. I LOVE QUESO!!! 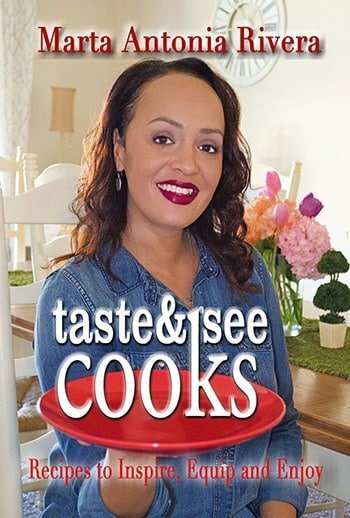 I will definitely be trying this recipe… STAT! My mouth is watering… and it’s only 4:40 in the morning. HA HA HAAAAA!!!! The power of queso is amazing sometimes! I think I’m going to make this on Sunday. don’t drink so if I’m going to the trouble…not the word I was looking for…then I want THE correct beer. And yes, let’s go Rams…although it should be the Chiefs playing and not the Pats. The beer I used is Fosters, but anything labeled “lager” or “ale” will do fine. While I’m not a huge spicy food lover, this would make a great dish to bring to our Super Bowl party. Poblanos are probably one of the least spicy peppers out there, so this should be perfect for you. I cannot wait to try this out. It looks SOOO good! I can’t wait for you to try it, either! I think you’re going to love it, Courtney! Oh I will definitely be making this for an upcoming party. I just wonder what I’ll serve to everyone else? Because this doesn’t look like something I will want to share. HA HA HAAA! I just love the way you think, Leigh! Girl, you started early! I’m still waiting for my 1099 to come and that takes forever! So I’ll be busy making and enjoying this roasted poblano queso dip while waiting for all my forms to come. I tend to forget the longer I wait, so as soon as I gather all the forms, I get to work! This yummy, gooey queso dip was so good! The cheese tips were very helpful since my cheese sauces sometimes seem grainy. The only thing I did different was I used more milk instead of the beer and added jalapenos to make it a bit more spicy. It was delish! I’m glad you enjoyed it, Valerie! Great way to substitute the beer if you’re not a fan.